Your introduction to a regular time with God. You may never have discovered how a regular 'quiet time' can help you grow and mature as a Christian. This short guide will help you get started. With daily readings, prompts and advice, it will encourage you to get established in a routine of engaging with God, and to discover the joy and liberty that comes from knowing Him. Join with the thousands of Christians around the globe who use Explore to help them read the Bible and pray every day. • What is the Bible, and why should we read it? • Unlocking the puzzle - a whirlwind tour of the Bible from beginning to end. Explore gives a few helpful comments on the passage and then some probing questions to help thinking about deeper issues including practical application. Nearly everyday there is cross referencing to another passage of Scripture to get a wider perspective on Biblical truth. It is good to have a range of writers and a plan to cover the whole of Scripture with Psalms interspersed. The best daily notes I have used! I bought this booklet to introduce my 19 year old to Explore Notes, and thought I'd read it first. i am so glad it did as it has been such a refreshing way to start the day, and I am loving it! It is such a helpful introduction to Explore and I am looking forward to passing it on to my daughter to encourage and challenge her in her relationship with God. Explore time with GOD is a very good Bible study notes if you ate looking for something that will go into some depthand relate yo you personally. 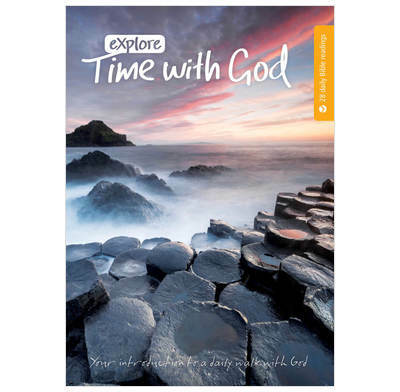 'Explore- Time with God' is a concise guide to seeing the Big picture of the Bible. It starts from the basics of listening to the word as from God. We now use it in our post-Alpha afternoon group. We have been learning about the God of the whole Bible, different styles of literature and ways to read it on our own. It is brief enough to complete in one session but has enough depth and we always have lots of extra questions and trips into related texts. I hope it will entice members to read on with Explore. Love it, love it, love it, Breathtaking and Challenging. Really great tool to start a quiet time habit, got this for my 2 daughters , then went on to explore and engage. thoroughly recommend. Before this book, I had never done regular Bible study. One friend recommended that I try some, and recommended this series to me. This book is an excellent starter to regular Bible study and gives a firm foundation of knowledge and inspiration to base further reading and faith on, so I have managed to keep up the reading so far! I would highly recommend this to anyone considering learning more about our faith. After using this tool, I went on to subscribe to Explore for the year. I am daily encouraged to serve God and as a result feel closer to Him and more prepared to face the day and life itself as a result. I would definitely recommend this to anyone.